Cards from standard English pattern deck printed by The Eagle Playing Card Company Limited (Conrad Jäger, Proschwitz), Czechoslovakia, c.1900. The cards are in imitation of American cards, but probably for the UK market. 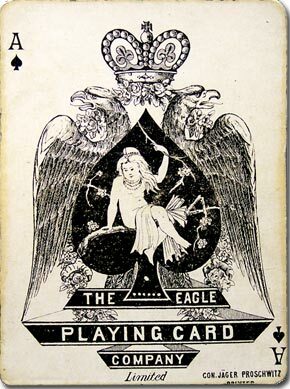 There had been American companies called Eagle Card Co., Middletown and Eagle Playing Card Co., Cincinnati, during the 1860s. The Ace of Spades (left) has the inscription "Con. Jäger Proschwitz, Printer" in the lower right-hand corner. [Images courtesy Jack Berkus]. • See also: 1908 Prague Jubilee Exhibition • 'Jugendstil' designed by Artuš Scheiner, 1920 • Czech Nationalistic Playing Cards, c.1895.